The NEM-Watch Platinum Model provides the ability to configure, through the NEM-Watch interface, alarms that are checked and triggered “in the cloud” – remote from your copy of NEM-Watch. 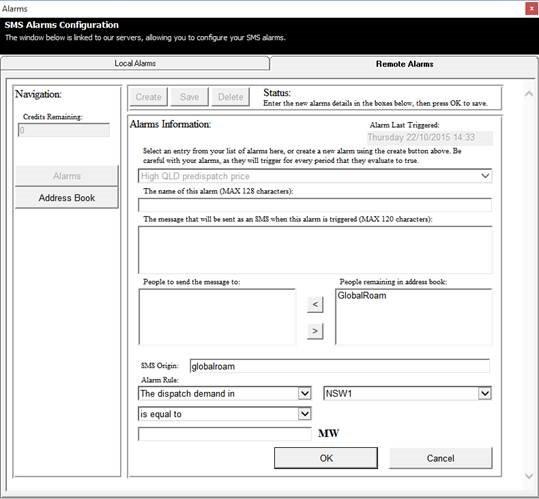 Unlike Local Alarms, Remote Alarms will be checked and triggered even if your local copy of NEM-Watch is not running when the market produces the outcome you are looking for. Form the message to be sent e.g. “Predispatch price in QLD = [data] @ [date]”. See the table below for details on the meaning of the [data] and [date] field. SMS origin, can be either and name or a number. The default value is “globalroam” but you can configure any value that is 10 – 15 digits or 1 – 11 characters. Note that the Remote Alarms service is not guaranteed for 100% uptime. It has been developed as an additional piece of functionality in the NEM-Watch package, but has not been developed with layers of redundancy should individual pieces of the process be unavailable for any reason.